It is August already and we are still waiting for our invitation to visit friends who spend the summer in The Hamptons. We envision driving out to the end of Long Island, stopping for tomatoes of course, and seeing how the other 1% live. But alas, we will be waiting forever as we do not have anyone friends summering in The Hamptons, so we will have to be content to visit the summer enclave of the rich and famous by other means. Specifically, the internet – where we found the website of East Hampton shop, Home, James. We loved looking at the Home, James collection and can once again picture how we would decorate our seaside home with some of their items. We particularly liked the Java Ice Bucket. 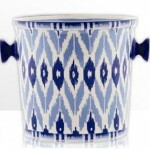 Although a bit pricey, this ice bucket would make a nice centerpiece for summer entertaining. Heck, we could build the whole decor of our summer house around this thing! See the Java Ice Bucket here. I mentioned that I have been down to the wonderful antique flea market, Todd Farm in Rowley, MA a couple of Sundays this summer. Todd Farm hosts hundreds of dealers every Sunday from April through November, and is a great place to buy and sell – I have done both on a few visits this season. On one recent trip, I set up my tent and a couple of tables of the various items culled from my mother’s collections – mostly her buttons and sewing collectibles. It is fun to sell at these types of markets. While selling I have the chance to meet great people who are truly excited to see and purchase the items my mother so lovingly collected for years. For my mom, it is a thrill for her to know that her things are going to people who share her passion and of course for her to pick up some extra cash. While selling, it is fun to meet the vendors set up nearby and share the experience and occasionally buy from each other. This one particular day, the vendor next to me had a large framed print of a military battle that kept catching my eye. At one point the vendor came over to see what I had for sale, and she had her eye on a couple of things. When we talked about a price, I said I would be interested in trading for the print – so that is what we did. I took the print and leaned it up against the front of my tent. I figured if someone came and wanted to buy it for more than I put up for it I would let it go. The funniest thing happened – that print caught the attention of several buyers, most of whom were able to identify it. 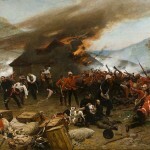 It turns out it was a depiction of a famous British battle – Rorke’s Drift – during the Zulu wars. I had some great conversations with many of the interested parties, some of whom just wanted to talk about it, others who made offers that were too low for me. 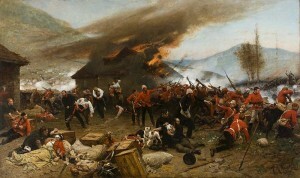 One particular older gentleman identified it as “The Defence of Rorke’s Drift” by Alphonse Marie de Neuville, and took my email address to send me more information on it when he got home – which he did. Apparantly the original hangs in the Art Gallery of New South Wales in Sydney. After several offers, someone did meet my price and I sold it at a nice little profit. A couple of people who made offers earlier circled back when they decided what I was asking was a fair price and were disappointed I sold it. What I learned was you can learn a lot from the people you meet at antique sales – and of course, if you see something you like, buy it when you have the chance, as it may not be there when you go back. Lost Cowboy is powered by	WordPress 5.0.4 and delivered to you in 1.841 seconds using 47 queries.